Casio Computer Co., Ltd. has announced the release of the GW-A1100, a new flagship model in the G-SHOCK Gravity Defier series which is conceived with pilots in mind. The new watch is equipped with an advanced compass function and other enhanced functionality, operability and visibility integrated in a highly sophisticated design. 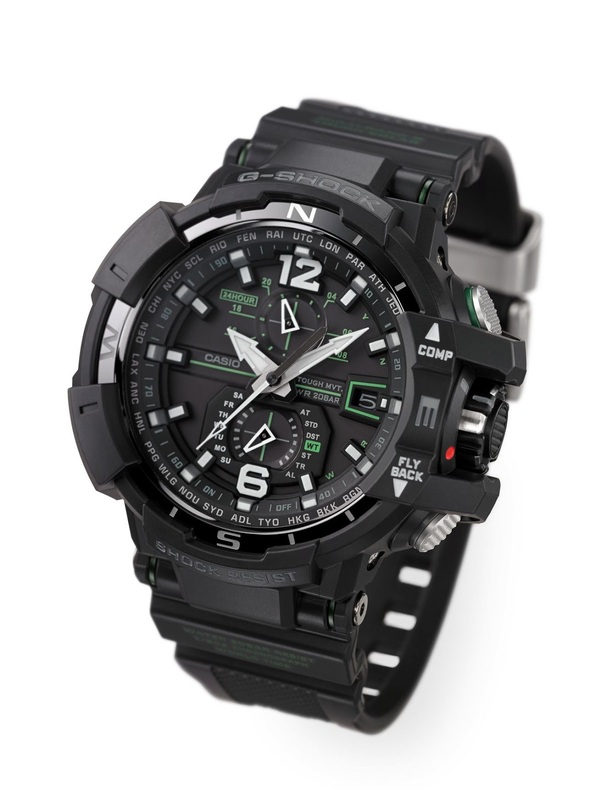 The GW-A1100 is a shock resistant watch that integrates the Multi Mission Drive, Casio’s unique analog drive system which moves the hands independently using separate motors, with sensor technology Casio developed while advancing its line of outdoor watches. A magnetic sensor miniaturized to just 5% of the conventional size and a unique noise reduction algorithm enable high-performance compass functions in a tough-style watch. Strong, light carbon-fiber is used for the second hand, which is also used to indicate the compass bearing. The hand maintains smooth, stable movement. The model also features tough Triple G Resist construction, and is equipped with the Smart Access system to enable intuitive operation of various functions. Functions such as World Time, the stopwatch, and alarm are easy to operate with the crown switch, which also has a quick-lock mechanism that enables simple lock and release. With luminous paint and a three-dimensional index, the wide-faced dial is easy to read. The highly functional GW-A1100 represents the pinnacle of performance for pilots, delivering all the shock resistance, operability and legibility the most demanding pilot needs.